Our offer includes casings, made of high quality plastic, which can be used for outdoor purposes. They are characterized by high manufacturing quality, versatile application and resistance to mechanical damages and weather conditions. DESCRIPTION: The connection-measuring sets are used to supply electric energy consumers, billed by direct measuring sets. They are installed on external building walls as flush or surface mounting. 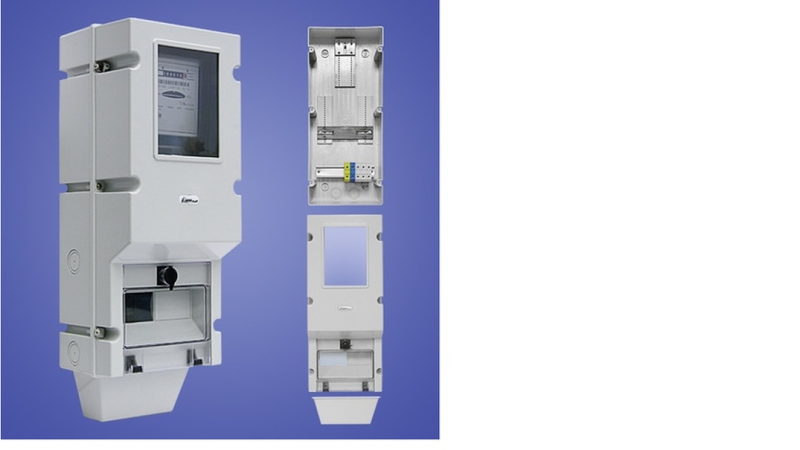 The casing is used to mount both 1-phase and 3-phase electricity meters, as well as circuit breakers. The casing is equipped with a terminal block, inspection glass, hole plugs enabling sealing and special ribs which enable easy performance of electrical penetration. The casing is also available with a metal lock.